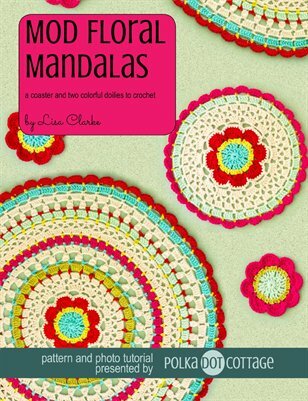 A Coaster and Two Colorful Doilies to Crochet! After hooking a few mandalas I found online and in books, I was inspired to take the flower motif from my Mod Floral Blanket pattern and adapt it for use in my own mandala design. I love the result! The Mega Mod Floral Mandala is 26 inches across and could entirely cover a small end table. That’s pretty big, as mandalas go, and not everyone needs that kind of coverage. With that in mind, I designed the Mini Mod Floral Mandala (which is just a foot wide) and the Mod Floral Coaster, which is a petite 5 inches and a perfect place to set down a mug of hot tea.